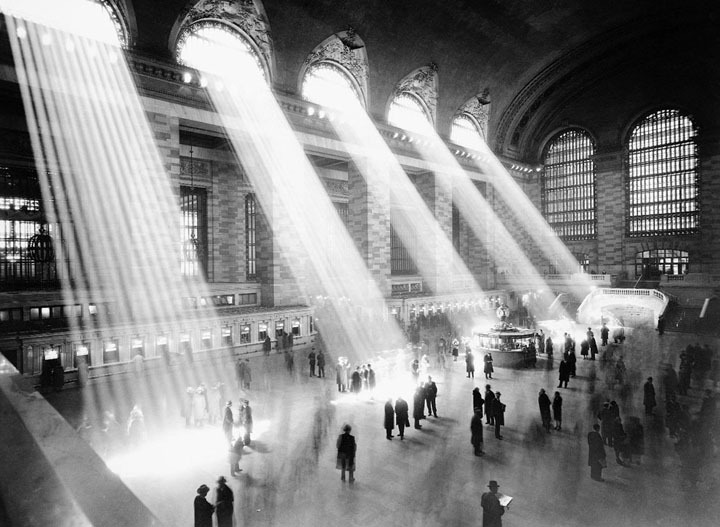 As daylight floods unfiltered through the windows in the vaulted main room of Grand Central Terminal (NYC), it’s easy to see how overwhelming the sun can be. Using sunlight in this manner was popular up to about 1940 when electricity became commonplace in homes and offices, all but eliminating the need for natural daylight. Using the sun to naturally light a room is now referred to as “daylighting.” In its simplest form, daylighting is merely the process of drawing light into a room. Not as simple as just opening window blinds, the light must be visually comfortable (not glaring) to provide the maximum benefit in energy and health. Both direct and diffuse sunlight impacts the quality of lighting in a room. In any regularly occupied office, conference room, classroom, break or lunch room the occupants will appreciate the benefits of natural light. Good daylighting has both a quality and quantity aspect. Quality is measured as the ability to be productive under the lights and healthier because of the natural light. It’s no secret that lighting conditions contribute to worker satisfaction and productivity. One’s overall wellbeing is much improved when exposed to sunlight daily. Quantity is captured, in part, through harvesting the daylight. Current technology and daylighting education provides several ways to “harvest” the sunlight. Harvesting combines both savings and efficient use of the sun to achieve monetary and comfort goals. In the last 25 years daylighting has come back into fashion with better understanding of how to effectively use natural light. Taking advantage of the sun to conserve energy and provide healthy, natural lighting is now essential to any building project. The ability to save electricity and enjoy warmth because of the sun is a key to “green building” and LEED certification, which rewards projects that have naturally lit spaces. Install room sensors. Room sensors can be set to automatically adjust the light levels based on the light available. Alternatively, manual dimmers and switches can be used to change the lighting as needed. By using a sensor, electricity is used only in the amount needed to achieve visually comfortable lighting levels, nothing more. Smart Glass. The newest technology in glass allows panes to change from completely clear and transparent to translucent or opaque with a switch or smartphone. The glass is made in such a way that an electronic pulse stimulates a change in the surface clarity. Smart glass can easily adjust the indoor lighting to compensate for brightness outside making the interior environment visually stimulating. Diffuse lighting. Effective in green building methods, diffuse light is especially useful in polar facing walls where bright light must be tamed for overall comfort or in areas where glass is not an optimal, like gymnasiums. Translucent panels are great for creating walls of light or letting light in without the hazards of glass. The translucent panels come in many colors and can provide an interesting look to overall architecture. Translucent concrete is another new item that is being produced in Europe. Though expensive it is stronger than glass and contains 4% optic fibers allowing light to pass through efficiently. Heliostats. The best way to use daylight is through designing with the polar exposures and site layout in mind. That is not always possible, especially when working with an existing building. This is why heliostats come in handy. Heliostats are mirrors that move automatically, following the sun, to redirect sunlight as needed. The light can be directed into a window or skylight simply by a change in the heliostat’s reflection. By combining aspects of design, site location, building components, lighting design and controls the final project will meet LEED requirements. Filtering the appropriate amount of daylight assures that everyone using the space will enjoy the benefits that come with daily exposure to the sun. With the technological changes in glass production, capturing light is now easier than ever.